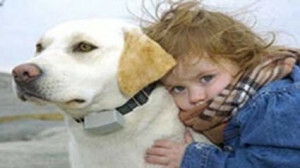 Dog Guard® understands: Your dog is family. TriState Dog Guard knows just how important it is that your dog leads a safe and happy life. Dog Guard “Out of Sight Fencing” allows your dog the freedom he deserves and provides you with peace of mind. Dog Guard Out-of-Sight Electronic Dog Fencing is a safe, affordable alternative to conventional fencing. Dog Guard Out-of-Sight Electronic Dog Fencing is veterinarian-approved combination of animal training and state-of-the art electronics. Dog Guard Out-of-Sight Electronic Dog Fencing has a unique transmitter that allows a wide variety of corrections for your pet at the transmitter, depending on your dog and it’s temperament. Dog Guard Out-of-Sight Electronic Dog Fencing offers: Trade Up Special Offers. Find the best solutions to keep your dog from roaming! At Dog Guard we know that contained pets are happier pets. Give your dog the freedom to run and play with boundaries and no fencing to maintain. Dog Guard Out-of-Sight Electronic Dog Fencing is on Yelp and offers the most satisfied customer reviews on the web. Please share our information with your friends & family, and on social sites like Facebook. The Dog Guard testimonials will give you the confidence you need to invite us over to meet your dog and discuss your indoor and outdoor electronic pet fence needs. And as always we try to add useful links to trusted places for your pet as we find them. Useful Links are just a way for us to be connected with some of the other services in the TriState area that may be useful for you to be aware of as a loving dog owner or aspiring dog owner! We strongly recommend that you view our infomercial, which provides a friendly yet informative overview for our wireless pet containment systems, the training program and other frequently asked questions. Dog Guard Out of Sight Fencing utilizes a digital radio signal to keep your dog within selected boundaries. By placing a thin wire underground, our professional installation team creates the safety perimeter. Crist Fencing LLC is is a proud distributor of Dog Guard Electric Dog Fence products made in the USA. Enter information or specifications that will help us better understand your project (such as specific materials, styles, gate dimensions, etc.). Crist Fencing installs Dog Guard in the following counties: Carroll, Jo Daviess and Stephenson in Illinois; Dubuque and Jackson in Iowa; and Crawford, Grant, Green, Iowa, Richland, and Lafayette. © COPYRIGHT 2019 Nursery Stock 2 Go Web Site Optimization by SEO Web Mechanics, Inc.